It’s time for Brag Monday #31! Today I’m bragging about 2 more projects from last week’s Brag Monday party. First I’m bragging about this very pretty Marie Antoinette Mother’s Day card, created by Frenchy at Le Chateau Des Fleurs. Be sure and check out her blog, she’s even included a tutorial so you can make one yourself! The image used is this Marie Antoinette image found HERE . Next, I’m bragging about Cindy from Recovery Artist She created this super adorable Theater in a Tin toy! 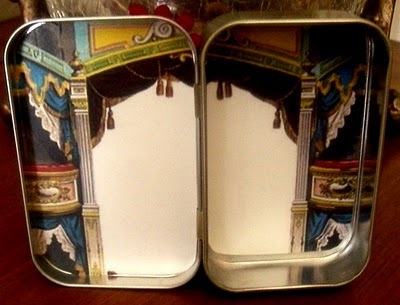 You really must click on the link to see the fabulous front and back of the tin as well. 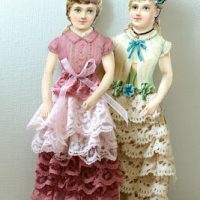 She made this along with a little story and some tiny ballerina’s, as a child’s toy. Wouldn’t this be great for traveling!! Cindy used the French Theatre image found HERE. If the linky isn’t working for you, please post your project link here in the comments. I think Mr Linky is still asleep this morning!! YAY! thank you Karen!!! This is so much fun! I am so happy you liked my cards! Beautiful brags for today, and the little tin theatre is adorable! I’ve been busy making things for my venture-a small retail space in a consignment shop. 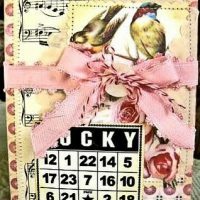 Here’s some wine gift bags with one of my favorite images from you-the garden gate. The two projects you chose are so lovely and creative. The little theatre is adorable.